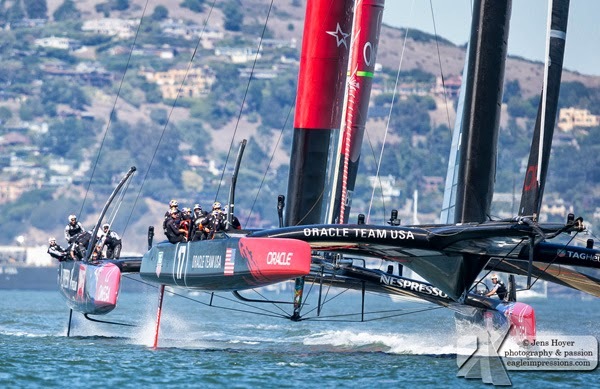 In what's being called one of the greatest comebacks in sports history, Team Oracle USA has accomplished the impossible, winning 8 races in a row to win the America's Cup over Emirates Team New Zealand in the winner-take-all 17th race. Just a week earlier, down 8 races to 1, the Kiwis were just one race away from victory and taking home the oldest trophy in international sports. But something clicked in Team Oracle USA at the halfway point of the competition and the team strung together an unfathomable 8 wins in a row to retain the Cup. The wing-shaped catamarans raced in this year's America's Cup are galaxies ahead in technology from the boats raced in the original Cup in 1851. The race has always been considered just as much a design competition as sailing competition, where huge sums of money and resources are devoted to developing and building the racing vessels. While the price and much of the technology are closely guarded secrets, the sport demands the financial backing of a sponsor like Larry Ellison, billionaire founder of Oracle, who owns the team. If you missed the race, you can see the replay and highlights on the America's Cup YouTube channel at http://www.youtube.com/user/AmericasCup. It's like nothing you've seen before.